Nikolaus Gelpke, the incoming president of the International Ocean Institute (IOI) and former student of Elisabeth Mann Borgese at Dalhousie, has donated $100,000 to the Dalhousie Libraries University Archives for an ambitions digitization project. Mr. Gelpke, publisher of the German-language periodical mare, The Magazine of the Sea, is funding the digitization of his esteemed teacher’s extensive collection of research and personal papers that are housed in the Dalhousie University Archives. 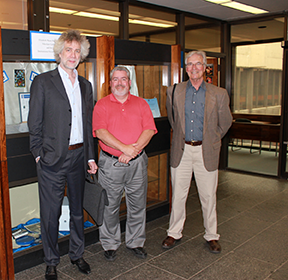 Nikolaus Gelpke, Michael Moosberger (Dalhousie Archivist), Michael Butler (Director, Halifax IOI). Elisabeth Mann Borgese is an important international figure who spent nearly twenty-five years working at Dalhousie. In the 1960s, Elisabeth and Arvid Pardo (then Maltese Ambassador to the United Nations), put forward the revolutionary concept that the oceans are “a common heritage of mankind” as part of the negotiations for the United Nations Convention on the Law of the Sea (UNCLOS). Although it was not enforced as a principle of International Law for the oceans as a whole, it was codified for the mineral resources of the sea-bed beyond national jurisdiction. 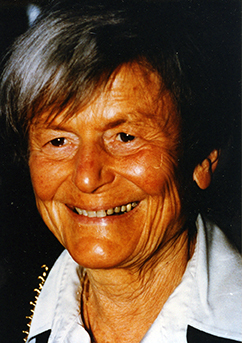 In 1972, Elisabeth continued her work in oceans by establishing the International Ocean Institute (IOI). “Oceans are a priority research area for Dalhousie and the Dal Libraries are pleased to be contributing relevant historical content in this area, thanks to the generosity of marine conservationist Nikolaus Gelpke. Elisabeth Mann Borgese was an important figure at Dalhousie, but she was truly a global citizen, and soon we will be able to share her research on a global level,” said Donna Bourne-Tyson, University Librarian of Dalhousie. “Elisabeth Mann Borgese is known around the world for her work in ocean conservation and management. Her papers in the Dal Archives have attracted researchers from as far away as Germany and New Zealand. Now, with this generous donation from Nikolaus Gelpke, we can begin the digitization process on the boxes and boxes of Borgese’s papers, making them available to researchers everywhere,” said Michael Moosberger, University Archivist with the Dalhousie Libraries. In all, there are 55.5 metres of material in the collection, meaning that the boxes of papers measure 55.5 metres when laid end-to-end. Additionally, there are fifty-one audio cassettes, forty-seven reel-to-reel audio tapes, three VHS cassettes, and two 16 mm motion picture films. Digitization in an archival setting is the process of manually scanning primary source material into a digital format and adding metadata to the digital object to provide information about the physical and intellectual makeup of the item. Each digitized item will be uploaded into the Dalhousie University Archives’ online finding aid for the Borgese Archive, so users searching the descriptive entries in the finding aid will be able to access the digital object with just a click of their mouse. “With Nikolaus Gelpke’s donation, we have budgeted for a year to get as much of the Borgese collection digitized as possible. The digitization of the Borgese collection will contribute to scholarship around the world, and the Dalhousie Libraries are proud to be contributing to that. We owe a sincere and deep thanks to Nikolaus Gelpke for making this project financially possible,” said Michael. • promote the concept of Pacem in Maribus, peace in the ocean and its management and conservation for the benefit of future generations. Interest in Elisabeth Mann Borgese continues to bring people together. Under the chairmanship of Dr. Douglas Wallace (Canada Excellence Research Chair in Ocean Science and Technology), personnel from IOI-Canada, Dalhousie University, the German Canadian Association of Nova Scotia and the Consulate of Switzerland in Halifax, are planning to bring the Elisabeth Mann Borgese Exhibit to Halifax in 2015. The exhibit, organized by the Buddenbrookhaus in Lübeck, Germany, displays Elisabeth’s cultural and scientific contributions to ocean governance. The exhibit recently completed a tour of major cities in Germany. It is unfortunate that your article neglects to mention that Elizabeth Mann Borgese was also the Chair of the Board of Directors of the International Centre for Ocean Development (ICOD). ICOD was a federal crown corporation, based in Halifax, Nova Scotia and was closed in the Conservative federal government budget cuts of 1992, along with 44 other federal crown corporations. ICOD was a primary donor of the International Ocean Institute between 1986 – 2002 and provided considerable financial and institutional support to help sustain the IOI. ICOD staff enabled the IOI to establish its status as a sustainable non governmental organization in Canada. ICOD also supported numerous academics and scholars at Dalhousie University, the Université du Québec à Rimouski, and Malmo University (Sweden) when it funded the creation of the Marine Affairs advanced Degree Programs and funded IOI scholarship recipients. In addition, ICOD funded hundreds of Canadian and international academics across Canada and internationally, as well as more than 600 international graduate students from Africa, Asia and the Caribbean to undertake Masters and Doctoral degrees at Canadian Universities. Without the dedicated support of the International Centre for Ocean Development, the IOI no doubt would have been forced to close it doors due to a lack of funding. Thanks for the additional information about Ms. Borgese. The blog post was not intended to give a complete description of her professional achievements, but rather to recognize the generous donation of her former student, Nikolaus Gelpke.